The rights under Art. 7 D.LG. n. 196/03. Recall that the person concerned has the right to know the source of personal data; the purposes and methods of treatment; the logic applied in case of treatment with the help of electronic means; the identity of the owner, manager and the persons or categories of persons to whom the data may be communicated or who can learn about them as managers or agents. You have the right to obtain updating, rectification or, when interested, integration of data; the cancellation, anonymization or blocking of data processed unlawfully, including data that need not be kept for the purposes for which the data were collected or subsequently processed; certification that the operations mentioned above have been made known, also regarding their content, of those to whom the data was communicated or disclosed except where this proves impossible or involves a means disproportionate to the protected right. You have the right to object, in whole or in part: for legitimate reasons to the processing of personal data, pertinent for collection purposes; to the processing of personal data for purposes of marketing. The right to object to the processing of data for the purposes of marketing carried out by automated contact extends to the traditional ones, saves prejudice to the person concerned the opportunity to exercise that right in whole or in part, or in opposition, to example, to only dispatch of promotional communications made through automated tools. To exercise these rights, please contact free (unless he confirmed the existence of data referring to the person) by writing to info@scsingegneria.it. A cookie is a small text file containing a certain amount of information exchanged between a website and your terminal (usually the browser) and is normally used by the operator of the website to store information necessary to improve the navigation within the site or to send advertising messages in line with the preferences expressed by the user in the field of web browsing. When you visit again the same site or any other site on the user's device checks for a cookie recognized, so you can read the information contained therein. The different cookie contains different information and are used for different purposes (efficient navigation in the pages of the same site, profiling in order to send promotional messages targeted analysis on the number of visits to the site). During navigation, the user can get on to their terminals also cookies sent by web sites to different servers (so-called third party), which may reside on some elements (eg. Images, maps, sounds, specific links to other pages domains) on the website that the user is visiting. More generally, some cookies (called session cookies) are assigned to the user's device for the duration of access to the site and automatically expire at the end of the browser. Other cookies (defined persistent) remain in the device for a prolonged period of time. It is used specifically for cookies allow proper operation and use of our sites. Cookies are used for example for the technical functionality of the user's login. They are provided mainly by third parties. These are cookies used in order to send advertising messages in line with the preferences expressed by the user in the field of web browsing. They can be delivered by our servers or through our website by third parties. Companies that offer or advertise their products through this site may assign cookies to the user terminals. The categories of cookies used and the type of processing of personal data by these companies are regulated according to the information made by these companies. It is cookie used for statistical analysis, to improve the site and simplify their use as well as for monitoring correct operation. This type of cookie collects anonymous information about user activity on the site. This type of cookie is delivered exclusively by third parties. The third-party sites that can be accessed through this website are not covered by this statement. La Vecchia Tabaccheria B & B disclaims any responsibility for them. The categories of cookies used and the type of processing of personal data by these companies are regulated according to the information made by these companies. More information on the treatments of personal data on the site. For more information on the processing of personal data collected on this site made by La Vecchia Tabaccheria B & B consult with the following information pursuant to Art. 13 Privacy Code. This information can be supplemented by additional information made at the time of any request for specific services. Purposes and methods of treatment. Mandatory or optional nature of providing data. Consequences of failure to provide. Personal information collected by the registration is processed to allow access to the services provided by the portal and as a member, and for the fulfillment of any associated legal obligations. The provision of personal data for purposes that is functional to the services requested and any refusal to provide would make it impossible to perform the services. The processing does not require the consent of those concerned. Personal data will also be used for the delivery of commercial and promotional information, direct sales, market research on products, services and events (hereafter jointly referred to marketing activities ??) of La Vecchia Tabaccheria B & B, and marketing activities directly by the latter on behalf of the company La Vecchia Tabaccheria B & B and also to third parties belonging to the publishing, finance, economy, industry, luxury, services, telecommunications, ICT , insurance and non-profit. 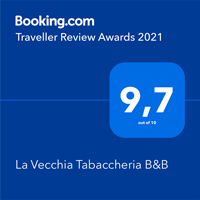 In future La Vecchia Tabaccheria B & B, reserves the right to carry out marketing activities also on behalf of other categories of third parties not currently defined. Treatment for marketing purposes will be processed using traditional (snail mail) and by the use of techniques of distance communication, such as telephone, also without operator, email, mms, sms. The provision of data for this purpose is optional and treatment requires the consent of the customer. The consent given for sending commercial and promotional communications via automated tools art. 130, paragraphs 1 and 2, D. lg. n. 196/03 extends to the traditional modes of contact. With the consent of the persons concerned they are made with electronic instruments, analytical data navigation and purchase decisions and Professional (profiling ??) in order to improve the marketing of the company La Vecchia Tabaccheria B & B. Failure to consent to profiling activities make it impossible to improve the supply of marketing so as to make it conform to the interests of users. Subjects or categories of persons to whom the data may be communicated or who can learn about them as managers or agents, and the scope of their dispersal. Personal data may be processed by a processor in charge of running the required services, marketing activities and data processors. Personal data may be disclosed to third parties to comply with legal obligations or to comply with orders from public authorities is what legitimized or to assert or defend a legal claim. If necessary in relation to particular services or products, personal data may be disclosed to companies that conduct, as autonomous data controllers, functions strictly connected and instrumental to the provision of such services or the supply of these products (eg. Poste Italian SpA, etc.). Without it, these products and services may not be provided. Your personal information will not be disclosed, unless the service you have requested requires the publication of the name. You have the right to know the source of personal data; the purposes and methods of treatment; the logic applied in case of treatment with the help of electronic means; the identity of the owner, manager and the persons or categories of persons to whom the data may be communicated or who can learn about them as managers or agents. To exercise these rights, please can contact free (unless he confirmed the existence of data referring to the person) by writing to info@scsingegneria.it. The data controller is La Vecchia Tabaccheria B & B Contrada Fumarola s.n. - S.P. 14 per Martina Franca - 72017 Ostuni (BR) - ITALY.